→ If you want to start the blog from the first entry, please scroll to the bottom. “There is no place like home,” I read those words and it just really resonated with me in regards to this project. We come and go from our homes. Sometimes for a quick trip and sometimes for long bouts, but there really is nothing like coming back home. We are not just creating a house, but a HOME. Our clients are excited for their new home and we can’t wait for them to move in. We have our fingers crossed that will be by the end of this year, but the next week will dictate the move in schedule. I was at the house today and it was freezing cold inside, remember there is no heat and doors are opened and closed all day, burrrr. The workers never seem to be bundled up in the cold house. I guess putting your sweatshirt hood over your head must keep you warm, I sure would need many more layers than that. They are troopers and they are getting the jobs done. Electrical is being repaired and reworked all this week and we hope to have the final sign off by the beginning of next week. This is just the “rough in”. Rough in is what’s behind the walls and in the Panel. The fun stuff comes later at “trim”. This is the same terminology for plumbing. Trim is when the new electrical/plumbing fixtures are hung and when it really starts to shine! 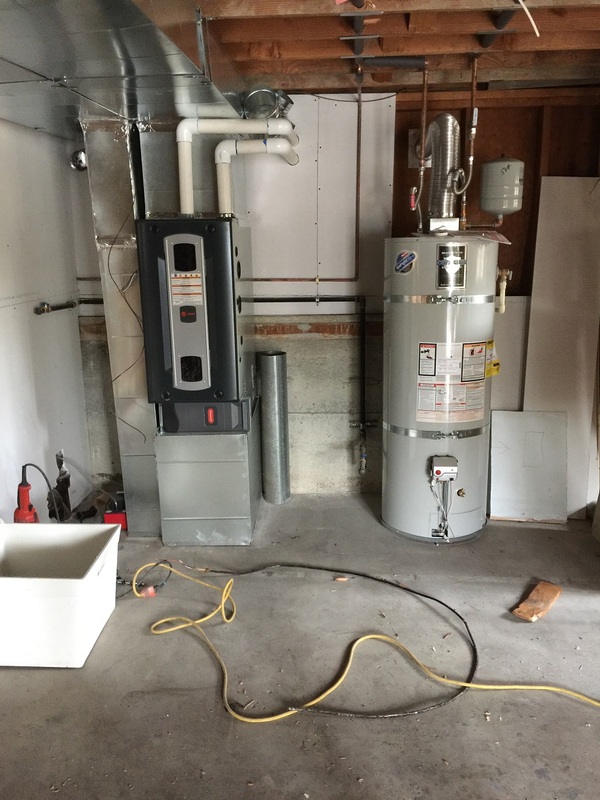 We also have the sign off for the gas piping and the new furnace. This is also getting wrapped up this week so we will finally have heat-that we need now. Time has gone by so fast on this project. This house is really starting to come back together quickly. This is rare that we are moving along as fast as we are, but it is great for the clients. We are starting to see our design choices get implemented. 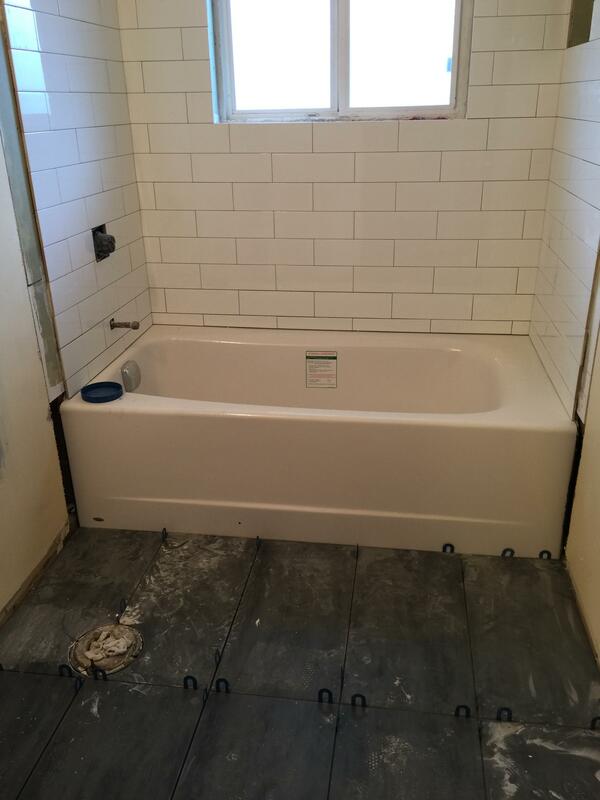 The main floor bathroom has been tiled around the new tub and on the floor, grout will be completed today and it will be ready for the plumbing and electrical trim. 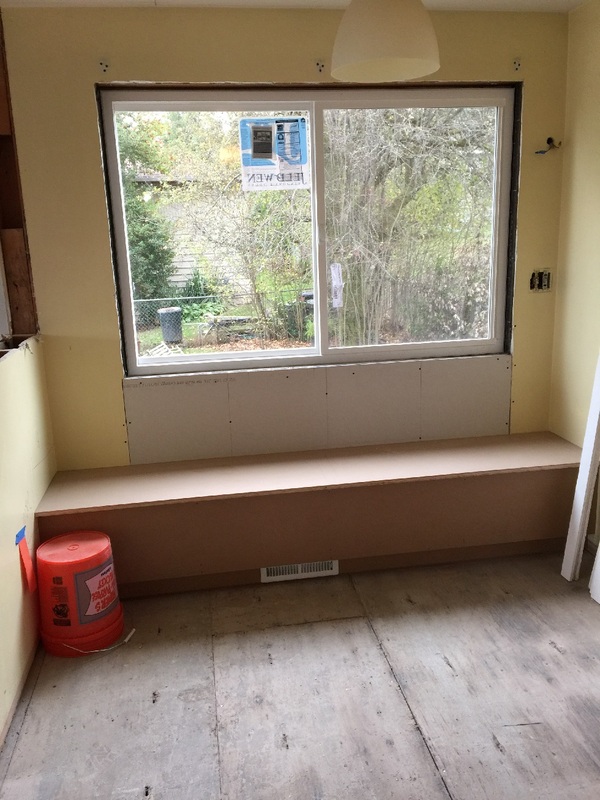 In the kitchen breakfast nook, we built a bench with storage underneath, I can just imagine the beautiful (kid proof) cushion and pillows to go on top. The closet in the master bedroom has its pocket door installed and we finally got the furnace moved to its new location in the laundry room, this opened up so much space for the new master suite. It is really quite a transformation that is hard to see in photos. We had the gutters guys come out at the end of last week to install new downspouts, of course it was going too smoothly until one of the parts that goes from the gutters and attaches to the downspout, snapped off. Guess what? The gutter guys don’t repair that one piece because it came off of the internal gutter system that is attached to the roof, you following, it was hard for me too. The things I have learned on this project. Of course, the rain was coming and I had to get this fixed, now. After many days of calls, amazing how people don’t call you back even after you leave them multiple messages, I used our construction contact (Lau Construction-Roofing) and he sent out a guy who fixed it, $450 later, but it is fixed and rain can now go freely down the downspout. Lau is a great resource! We timed the painting of the outside of the house perfectly. We had a beautiful stretch of sunny warm weather a week ago and got the whole thing painted. 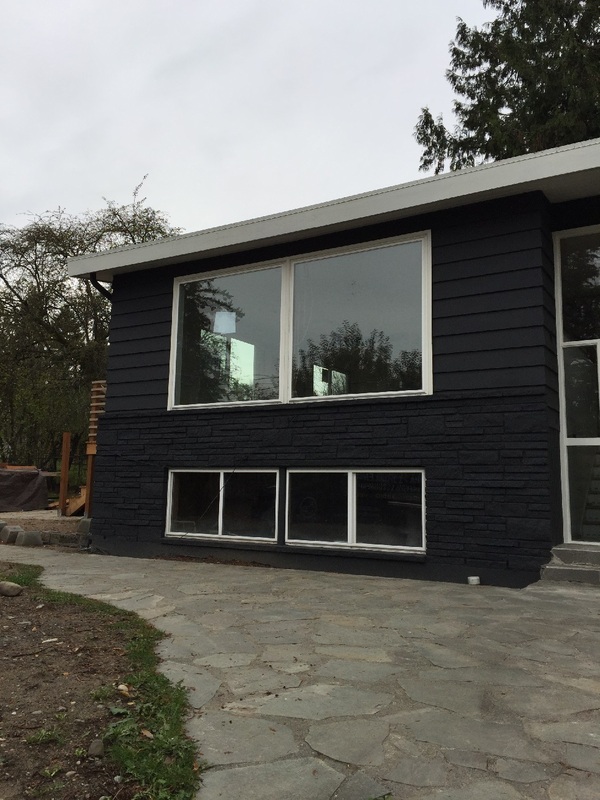 We choose a dark color to cover up the imperfections on the outside of the house and it turned out great. The white trim goes perfectly with the windows and just pops. Once we get the light fixtures hung on the outside and the new garage doors, we are set for the exterior. Then the landscaping is up to the clients and they will work away at this slowly and into the spring and summer. This house is now completely critter proof! It is clean and there is no place for them to get in. We have repaired all holes, reinforced any questionable areas and all new drywall is being put up soon, it’s almost like a new home. It is going to be safe(electrical) and free from leaks, holes and moisture. It will be insulated and will feel like a fresh new home. It smells good and feels good! I finalized our new door and door hardware order. Did you know that you can actually spend many hours on figuring out not only what door levers would look best for this type of house, but what way should the door swing, what side are the hinges going on, is it a left handle or right handle door, I think you get the idea! But I’m done, so glad our clients love the style and the satin nickel finish. They are going to look beautiful with the single panel clean white doors. This will give the house both a traditional and contemporary look, which is what we are going for. The electrical install will finish up in a few days, then comes the drywall, the rest of the plumbing, insulation and then painting. The hardwood floors will get refinished then kitchen and bath cabinets and counter tops will be installed. December will be quite the month of noted improvements and it will be like Christmas for this house! Thanks for reading and posting great comments, if you have more questions please comment and we’ll get back to you. So fun to watch the progress! Excited for each new reveal!